Iolite is the name used for gem quality specimens of the mineral cordierite. Gem iolite is typically light to dark blue or violet blue in color, with excellent transparency and strong pleochroism. It is quite a hard material, about the same as tourmaline, so it is suitable for all kinds of jewelry. Iolite is also a fairly inexpensive stone, especially when compared to other violet-blue gems such as tanzanite. Cordierite is a magnesium iron aluminum cyclosilicate that was first discovered in 1813 and was named after the French geologist Lousi Cordier (1777-1861). Cordier was professor of geology at the Muséum national d'histoire naturelle in Paris from 1819 to 1861 and developed the geological gallery in the museum. Cordierite is typically found in metamorphic rocks along with sillimanite, spinel, plagioclase feldspar and garnet. Gem quality material is rare and clean stones with good color can be quite beautiful. 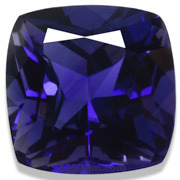 The violet-blue color is considered ideal, but iolite may also occur in ilght yellow, green, gray or brown. Iolite is strongly trichroic, meaning that it shows three colors when viewed from different angles. Iolite's strong pleochroism earned it the nickname water sapphire, since from one direction iolite can appear sapphire-like blue and from another, it can appear as clear as water. From yet another angle it can appear a light golden color. The video below shows this pleochroism quite well. Gemologically, iolite has a hardness of 7 to 7.5 on the Mohs scale and forms in orthrhombic crystals. It has a refractive index of 1.542-1.578 (similar to quartz) and a density or specific gravity of 2.58-2.66 (in the same range as chalcedony). Its unique pleochroism is a key to identifying iolite. Iolite is found in many locations around the world, including Australia, Brazil, Burma, Canada, India, Madagascar, Namibia, Tanzania and the USA. We have recently cut some very fine material from Madagascar.